Details: Fast and convenient, the AeroPress Coffee and Espresso Maker makes one of the best cups of coffee you'll ever taste. This innovative uses the ideal water temperature and gentle air pressure brewing to produce coffee and espresso that has rich flavor with lower acidity and without bitterness. It makes 1 to 4 cups of coffee or espresso (enough for 1 or 2 mugs), features a micro filtered for grit free coffee, and takes just 1 minute to make coffee (actualpress time takes only 20 seconds). This will result in a double espresso. To make an Americano, simply top off the mug with hot water, or add hot milk for a creamy latte. 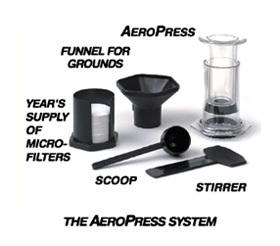 The AeroPress can press from 1 to 4 scoops, and each scoop from the included AeroPress scoop makes the equivalent of a single espresso or 5 ounces of American coffee. Fill the chamber with hot water to the number corresponding to the number of scoops. You can also make a full carafe of coffee using the AeroPress in less time than it takes to brew a pot of drip coffee. Two 3-scoop or 4-scoop pressing, topped off with hot water, will fill most vacuum carafes. The AeroPress is the result of several years of applied research by inventor/engineer Alan Adler, who conducted numerous brewing experiments, measuring the brew with laboratory instruments. The experiments demonstrated that proper temperature, total immersion and rapid filtering were key to flavor excellence. He then designed and tested dozens of brewers before settling on the AeroPress design. Adler's best-known invention is the Aerobie flying ring which set the Guinness World record for the world's farthest throw (1,333 feet). Traditional drip brewing passes water through a bed of grounds. When the water first drips into the bed, it is too hot and bitterness is extracted. As the water filters downward through the bed, it becomes too cool and extraction is weak. The water doesn't contact all of the grounds uniformly. Grounds at the edge of the bed are under-extracted, while grounds at the center are over- extracted and contribute bitterness. The drip method cannot make a robust single cup because the small amount of water doesn't heat the bed enough for rich extraction. It is also slow. AeroPress makes one to four servings with a single pressing in less than a minute. The flavor is equally rich for any number of cups. Most coffee lovers agree that espresso is less bitter than drip brew because of the shorter brewing time. However when we ran comparison taste-tests in the homes of espresso lovers, they all agreed that AeroPress espresso tasted better than the brew from their high-priced European espresso machines--why? The reason is that the total immersion brewing of the AeroPress yields a robust flavor at lower temperature--and lower temperature brew is far less bitter. Home espresso machines don’t allow adjustment of temperature. But even if they did, their lack of total immersion would not yield robust flavor at reduced temperature. In addition to smoother taste, the AeroPress has several other advantages over conventional espresso machines. There is no need to judge when to stop the pull. This is the most critical skill in using an espresso machine. As espresso lovers well know, most would-be baristas in coffee shops, hotels and restaurants run the pump too long--extracting sour bitterness from the grounds. AeroPress coffee is micro-filtered. It so pure and particle-free that it can be stored for days as a concentrate. The concentrate can be drunk as espresso, mixed with milk for lattes, or diluted to make American coffee. French presses cannot make espresso or lattes. Finally, cleaning the French press is quite a chore. The AeroPress chamber is self-cleaning. A ten-second rinse of the plunger is all that's required.